CR 1/2 AA CR1/2AA 3V Lithium Cell (CR14250). Type: Lithium Manganese Dioxide (LiMnO2). Voltage: 3 V.
Length: 25.1 mm. Diameter: 14.75 mm. Price: £5.99 each. £5.52 each if you buy two or more. Postage and packing included. Replaces: CR1/2AA, CR 1/2 AA, CR 1/2AA, CR1/2 AA, CR-1/2-AA, CR14250, 6127, ECR1/2AA, BR1/2AA, BR 1/2 AA, BR 1/2AA, BR1/2 AA, BR-1/2-AA, BR14250. 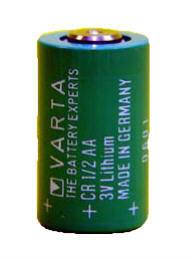 This Varta CR1/2AA, or CR14250 3V Lithium battery replaces Sanyo Lazer Lithium CR14250SE batteries and many others. The Varta CR1/2AA version of this CR14250 3V Lithium battery has its 'pip' as the negative terminal and the flat contact is the positive terminal. This is not the case with the EEMB version that we typically sell, so take care with polarity. This Varta CR1/2AA, or CR14250 3V Lithium battery is widely used for CMOS memory backup in personal computers, for dive computers and for many other electronics applications. This Varta CR1/2AA, or CR14250 is a high-capacity cylindrical-type Primary Lithium Battery with a bobbin structure and laser-sealing. The Varta CR1/2AA, or CR14250 uses Lithium Manganese Dioxide chemistry for a high energy density and a wide operating temperature range of -40°C to + 85°C. Self discharge is low at less than 0.5% per annum at 20°C, giving an effective shelf life of 10 years. With such a long shelf life, why not buy two or more packs of the Varta CR1/2AA, or CR14250. Take advantage of our reduced price and make sure you are not left in the lurch next time your battery runs out. Visit here if you need the tabbed version of this cell with nickel strip solder tags. Visit here if you need the tabbed version of this cell with three-pin polarized solder tags.